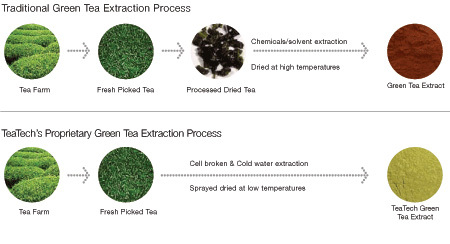 Xel's patented extraction method to extract the entire ingredients from fresh green tea leaves using only cold water. This proprietary cell-broken extraction process preserves all the naturally existing nutrients, taste and color contained in fresh green tea leaves, providing a unique fresh green tea extract high in polyphenols (antioxidants, including EGCG known and recognized as the most important and powerful polyphenols available and found only in green tea), vitamins, minerals, amino acids, fiber and more. Most commercially available green tea extracts are made using alcohol, organic solvents or chemicals to extract the polyphenols from the tea leaves. 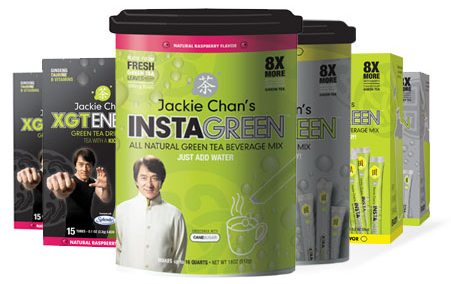 Xel's green tea extract is the only brand that is 100% chemical free and 100% natural. Xel's cold water extraction method is also applicable to the entire ingredient extraction of plants, herbs, vegetables and fruits to preserve the freshness and potency of all natural nutrients without the contamination from chemicals and organic solvents. In addition, Xel's proprietary extraction technology allows isolating and purifying the single pure compound from herbal extracts, which truly brings the traditional Chinese Herbal Medicine to an extremely superior level and is able to further develop advanced drug delivery systems to meet the Western standards and regulations. Please visit TeaTech for more information.